The art didgeridoos are concert quality instruments. Forged through an alchemical collaboration of Tanya's visionary hands and Rob's passion for carving sweet sound. 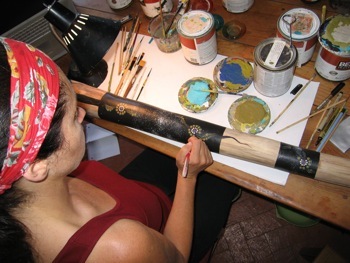 All Art Didgeridoos are hand crafted and hand painted. Some are adorned with inlay of abalone, pahua shell and various semi precious stones. Each instrument is an original work of art with 25 to 40 hours of painting. A worthy addition to any didgeridoo enthusiasts collection.